I was there with the Canadian Red Cross team comprising of 2 doctors, 3 nurses and 2 technicians from Canada, 1 doctor and 1 nurse from the Philippines, 2 Nepali Interpreters and 3 drivers. We were in the clinic when the second big earthquake hit Nepal. We were 16 kms away from the epicenter this time and I cannot describe in words what that felt like. We had big rocks rolling down from high hills around us and landslides taking place very frequently. The area was deemed too dangerous and a Chinese Rescue helicopter with a max capacity of 18 people was sent to bring back the deployed Canadian Red Cross team. 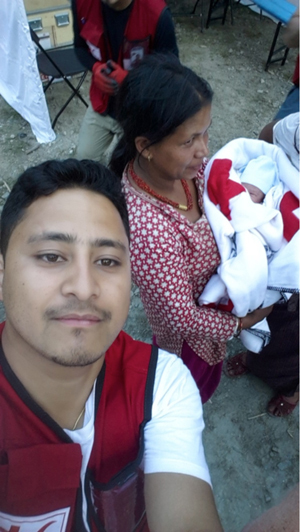 Sushan Pradhan, an MDEM graduate helping his family and neighbourhoods in Nepal after the devastating 7.8 magnitude earthquake hit the country on April 25, 2015. Before the helicopters arrived a group of locals made a run for the helipad requesting us to take them along but having 2 stranded Indian nationals working in the area in relief activities and a severely injured patient we were already max capacity. The locals argued that they should be taken in the helicopter instead of the expatriates. When we informed them that their requests could not be addressed by us and the orders would have to come from higher authority, the locals picks up rocks and claimed to smash the helicopters if we did not take them along. Until that point we were seen as their only hope for relief and survival but seeing us plan an evacuation leaving them behind turned them from friends to foes in a matter of minutes. They had a legitimate claim as they too were in the harm's way but we had no other option than to leave the area as soon as possible which made them lose all hopes of surviving. I wanted to share this experience here because it describes a very crucial humanitarian negotiation point which could have ended up with a bloody situation for us. Along with Dr. Stanley (our team leader) and I faced the crowd to negotiate our lives for theirs. I honestly cannot remember how or what we said or if we even were able to convince them in any way but we succeed in getting them to turn around and let us leave the area unharmed. That negotiation we did with the furious community has by far been the greatest relief challenge/experience I faced. Right now we (my parents and I) are working on installing water purification stations in communities surrounding us. The rainy season is approaching soon and due to the eroded hills, the supply of water is expected to be highly disturbed for the next 3 months. We have had a few donations from our friends in Scotland and Australia and adding a little from our pockets to that has left us with enough to make a huge difference in a few areas. Excerpt from an e-mail sent by Sushan Pradhan, a MDEM graduate from Nepal who was on the scene when the 7.8 magnitude earthquake hit Nepal on April 25, 2015.